Just when I thought the party was over and that the cycling season was coming to a dead end, we were surprised with a sunny, crisp day out of heaven. 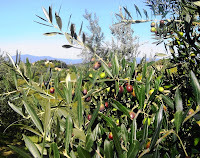 The focus in Tuscany now is the raccolta, which translated literally, means "the collection", specifically, the collection or the harvest of olives. It is happening all around us. The grapevines have moved backstage, setting themselves up as the golden background, and it's the olive trees who are now showing off like a million dancers moving up front to grab all the attention. The olive trees are saying to the grapevines "It is now our turn." During the next few weeks another spectacular "live show" will unfold and come alive in front of our eyes. I feel so blessed every day that I spend marveling at the wonders of Tuscany as seen on a bike, with groups of people as passionate and endearing as the group that I guided today. This was a group from the U.S. and Canada, and included two honeymooning couples who always add something special to our tours. 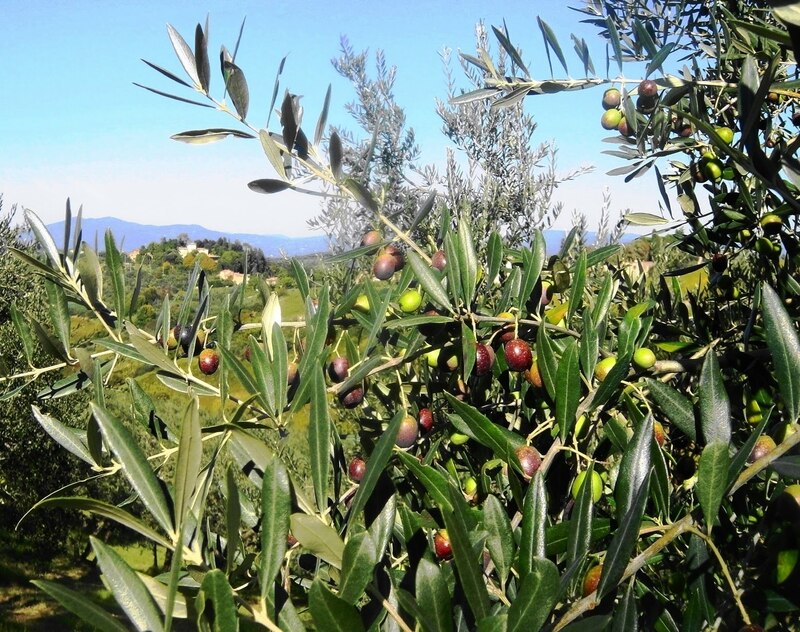 Because the weather was so fine, we were able to really enjoy our stops to walk through the olive groves and to admire and photograph the crisp landscapes of the Tuscan countryside. In the next few weeks I will be learning and living the raccolta. Soon we will begin to see the nets spreading out under the trees! Another great event to share with my bike tour groups.